USA TODAY, The Nation's No. 1 Newspaper, perfectly captures the way fans feel about Adele and her music: "Adele doesn't just sing; she changes your life, makes you feel like you're not alone, almost like she wrote and sang each song for you and you only." When she was only 19 years old, Adele released her first single, "Hometown Glory." Two years, two albums, and a lot of heartbreak later, she swept the 54th Grammy Awards, winning all six categories for which she was nominated. In her short career, Adele has overcome a terrifying obstacle: a throat condition that many fans worried meant she would never sing again. 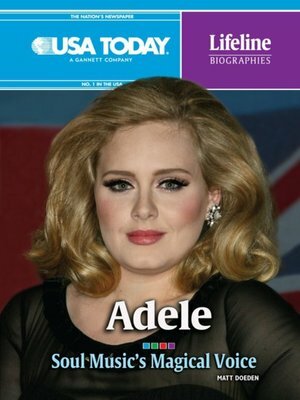 This insightful biography follows the rise of Adele Laurie Blue Adkins, a girl from north London, into the megastar Adele, a skilled singer-songwriter who proves that "sublime talent and compelling songs can still draw the masses."